Can you help identify a man in connection with two recent burglaries in Banstead? ​We are appealing for the public’s help in identifying the man from the CCTV images, in connection with two burglaries in Banstead. Do you recognise this caravan? 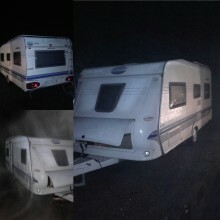 A white Hobby prestige caravan which we believe has been previously stolen, has been found abandoned on Desborough Island next to the rifle club in Weybridge. Five people have appeared in court (Friday, 12 April) after undercover officers gathered evidence of county lines drug dealing in Guildford. Can you help us identify this man in connection with two burglaries at a property in Woking? We are appealing for the public’s help in identifying the man in this CCTV image as we would like to speak to him in connection with two burglaries at a property in Woking. We are appealing for witnesses following a pursuit involving a blue Mini Cooper in Horley on Friday (12 April). ​We have released CCTV images of two men we would like to speak to after a group of young children were engaged in conversation by two men in a park in Smallfield yesterday afternoon (14 April). ​We are appealing for witnesses after receiving multiple reports of large rocks being thrown from the footbridge over Junction 10 of the M25 yesterday (14 April). We are appealing for witnesses after a man was assaulted in Epsom. At around 2.30pm on Friday, 12 April the victim was walking along the pavement of Longmead Road towards Chessington Road, when two unknown men on a motorbike mounted the pavement, punched the victim to the back of the head and then drove off. ​Surrey Police is assisting Surrey Fire and Rescue Service in investigating a fatal fire in a house in Holywell Way, Stanwell. Surrey Police is clamping down on drivers using mobile phones as part of a national campaign to eradicate one of the chief causes of serious collisions.